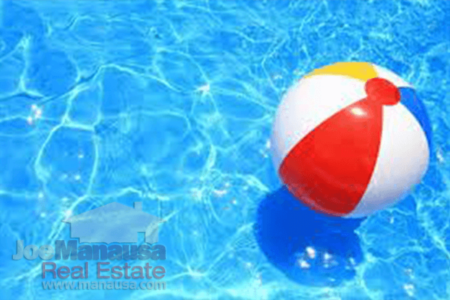 If you plan on buying a home sometime soon, you might be curious about how you are going to pay for a home. There are plenty of options for those with great credit and cash reserves, but the options are limited if your finances are limited. Before you run off to some online loan-promising-website, you might want to bone-up on the facts so that you are not easily misdirected. 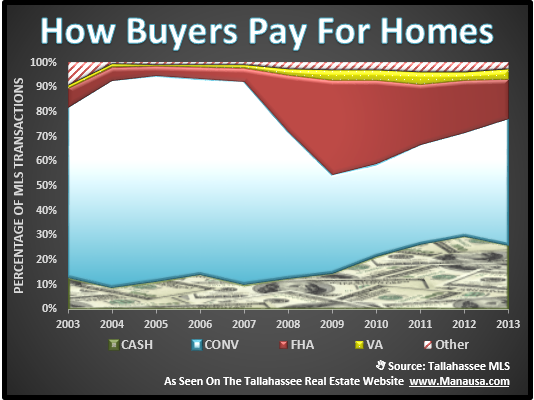 In order to get a feel for what others have been doing, I pulled up all home sales in the Tallahassee MLS for the past 10+ years. I then created the following real estate graph and sorted all the money sources into one of five groups: Cash, conventional loans, FHA loans, VA loans, and then all other sources of funds for buying a home. Regardless of the market, three sources deliver about 90% of the funds for people buying a home. 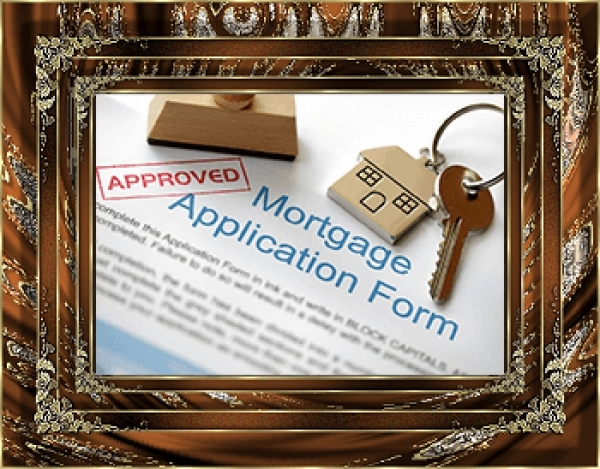 They either pay cash, they use a conventional mortgage loan, or they use an FHA loan. It is interesting to note how the government insured FHA loans (red shaded area) boomed during the beginning of the real estate market recovery, but it appears that conventional loan programs are finally creeping back into the market (blue shaded area). 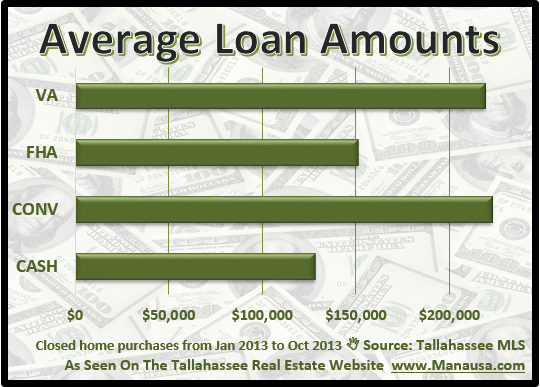 I was also curious to see what the average loan amounts were for people buying a home in Tallahassee over the past ten years. I was not surprised to see conventional loan programs had the highest loan amount, but the fact that VA loans were so close was somewhat surprising. FHA insured loans are a type of federal assistance and have historically allowed lower income Americans to borrow money for the purchase of a home that they would not otherwise be able to afford, but my experience over the past 22 years in the Tallahassee real estate market shows that these loans are for the majority of homebuyers in Tallahassee. The current slate of conventional loans that allow financing to 95% LTV (and historically low mortgage interest rates) are the reason that FHA loans are not dominating the market. But our local FHA loan limit of $271,050 is nearly double the median home price, thus we will see a cyclic change in the future. As interest rates rise and home affordability declines, don't be surprised to see a resurgence from these government insured loans. 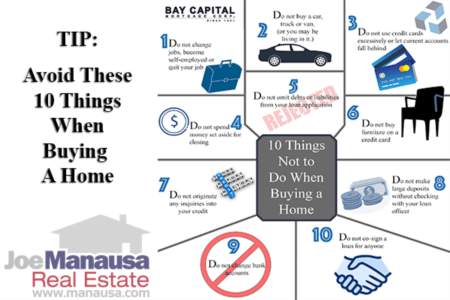 If you want more information on how much home you can afford and how to get approved for buying a home, simply fill out the form above and we will have a qualified mortgage lender get you qualified promptly.